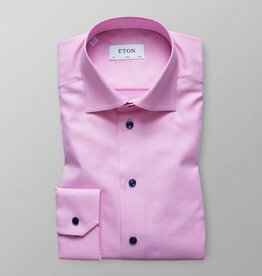 The soft pink colour and rich structure in this royal dobby design makes this shirt a versatile addition to the any discerning wardrobe. Details such as the blue buttons and tread gives a perfectly well-dressed impression. Wear it under fine suiting for a timeless business look, or under a fine knitted cardigan for a relaxed, yet sophisticated outfit. Vibrant pink meets contemporary details in this fine houndstooth patterned shirt. The gentle blue colour and rich structure in this royal dobby design makes this shirt a versatile addition to any discerning wardrobe.